In searching for notable American Landmarks, the iconic "Cloud Gate" is sure to top the list. During a layover in the windy city, I couldn't pass the opportunity to traverse the frigid great-lake air of Chicago in hunt of a distinctive image was forefront in my mind. With O'Hare International Airport a major international hub in the mid-west, this hardly constituted my first visit to Chicago...yet, the first time I found myself visiting the local landmark. On a cold, cloudy, and yes, windy afternoon in early March I jumped on the "L" and headed toward Millennium Park. "Cloud Gate" is a modern art sculpture by British artist Anish Kapoor. Constructed between 2004 - 2006 and formally dedicated to the city of Chicago on May 15, 2006...now referred to as "Cloud Gate Day" by the city of Chicago. Measuring 33' x 66' and weighing 110 tons, "The Bean", as it's referred, has a 12' arch at it's center and is crafted from 168 polished stainless steel panels seamlessly welded together. The artist, inspired by the look and form of liquid mercury, used the substance as a template in its creative design. Construction began on-site in June of 2004. Due to scheduling constraints an unfinished work was on display for Millennium Park's commemoration ceremony on July 15 of that year. With overwhelming positive recognition for the in-progress artwork, officials...against the artist's wishes, were swayed into leaving the structure unveiled for several months. Scaffolding once again was raised in January 2005, during the final stages of polishing; Cloud Gate was officially dedicated to the city of Chicago by Mayor Richard M Daley on May 15, 2006. In the end, the artwork cost private and public donors a combined $23 million USD to complete. 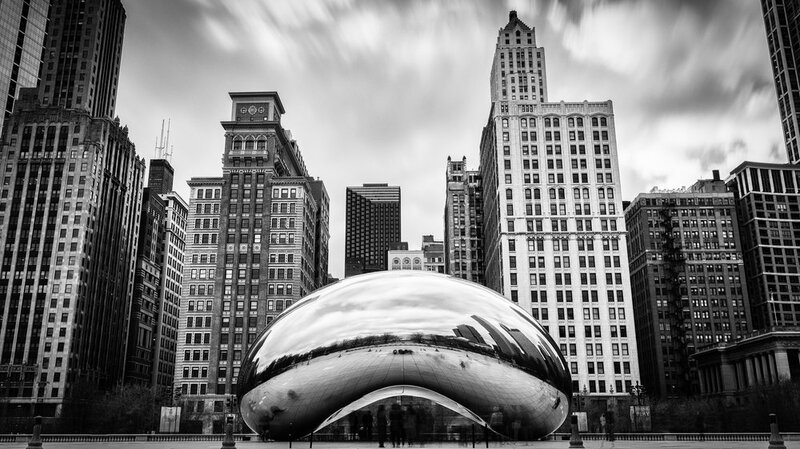 Critical acclaim and admiration for "Cloud Gate" has since fixated the art-piece as a staple of Chicago and international recognition as an American Landmark; A symbol now synonymous with the city of Chicago, forged only a few short years ago. The artwork is named "Cloud Gate" because 80 percent of its surface reflects the sky. The sculpture's creator Anish Kapoor is making waves through an artist dispute over the proprietary rights to a color pigment patented as Vantablack, the "blackest black". The materials used in the construction of the sculpture are contracted to last 1000 years. Cloud Gate is wiped down and cleaned on a daily basis, with a bi-annual cleaning drenching it with 40 gallons of Tide liquid detergent. *Additional images can be found on Facebook. & Instagram. **Products purchased through attached links provide a small commission; a great way to show support and help keep this site advertisement free.